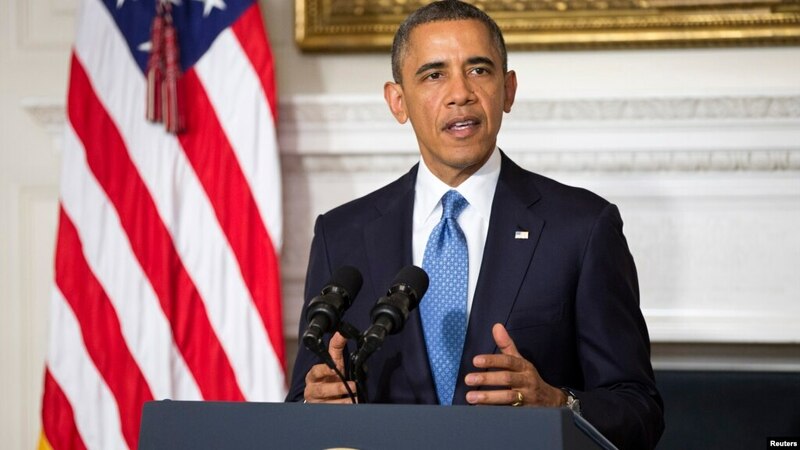 “Today, after two years of negotiations, the United States, together with our international partners, has achieved something that decades of animosity has not: a comprehensive long term deal with Iran that will prevent it from obtaining a nuclear weapon. This deal demonstrates that American diplomacy can bring about real and meaningful change — change that makes our country and the world safer and more secure. This deal is also in line with a tradition of American leadership. It’s now more than 50 years since president Kennedy stood before the American people and said, ‘Let us never negotiate out of fear but let us never fear to negotiate.’ He was speaking then about the need for discussions between the United States and Soviet Union, which led to efforts to restrict the spread of nuclear weapons. In those days the risk was a catastrophic nuclear war between two superpowers. In our time, the risk is that nuclear weapons will spread to more and more countries, particularly in the Middle East, the most volatile region in our world. Today, because America negotiated from a position of strength and principle, we have stopped the spread of nuclear weapons in this region. Because of this deal, the international community will be able to verify that the Islamic Republic of Iran will not develop a nuclear weapon. This deal meets every single one of the bottom lines that we established when we achieved a framework earlier this spring. Every pathway to a nuclear weapon is cut off. In the inspection and transparency regime necessary to verify that objective will be put in place. Because of this deal Iran will not produce the highly enriched uranium weapons grade plutonium that form the raw materials necessary for a nuclear bomb. Because of this deal Iran will remove two-thirds of its installed centrifuges, the machines necessary to produce highly enriched uranium for a bomb, and store them under constant international supervision. Iran will not use its advanced centrifuges to produce enriched uranium for the next decade. Iran will also get rid of 98 percent of its stockpile of enriched uranium. To put that in perspective Iran currently has a stockpile that can produce up to 10 nuclear weapons. Because of this deal, that stockpile will be reduced to a fraction of what would be required for a single weapon. This stockpile limitation will last for 15 years. Because of this deal, Iran will modify the core of its reactor in Iraq so that it will not produce weapons-grade plutonium. And it has agreed to ship the spent fuel from the reactor out of the country for the lifetime of the reactor. For at least the next 15 years, Iran will not build any new heavy water reactors. Because of this deal we will for the first time be in a position to verify all of these commitments. That means this deal is not built on trust. It is built on verification. Inspectors will have 24/7 access to Iran’s key nuclear facilities. Iran will have access to Iran’s entire nuclear supply chain — its uranium mines and mills, its conversion facility and its centrifuge manufacturing and storage facilities. This ensures that Iran will not be able to divert materials from known facilities to covert ones. Some of these transparency measures will be in place for 25 years. Because of this deal inspectors will also be able to access any suspicious location. Put simply, the organization responsible for the inspections, the IAEA, will have access where necessary, when necessary. That arrangement is permanent. And the IAEA has also reach an agreement with Iran to get access that it needs to complete its investigation into the possible military dimensions of Iran’s past nuclear research. Finally, Iran is permanently prohibited from pursuing a nuclear weapon under the nuclear nonproliferation treaty, which provided the basis for the international community’s efforts to apply pressure on Iran. As Iran takes steps to implement this deal, it will receive relief from the sanctions that we put in place because of Iran’s nuclear program — both Americans’ own sanctions and sanctions imposed by the United Nations Security Council. This relief will be phased in. Iran must complete key nuclear steps before it begins to receive new sanctions relief. And over the course of the next decade, Iran must abide by the deal before additional sanctions are lifted, including five years for restrictions related to arms and eight years for restrictions related to ballistic missiles. All of this will be memorialized and endorsed in a new United Nations Security Council resolution. And if Iran violates the deal, all of these sanctions will snap back into place — so there’s a very clear and senate for Iran to fall through. And there are very real consequences for a violation. That’s the deal. It has the full backing of the international community. Congress will now have an opportunity to review the details and my administration’s stands ready to provide extensive briefings on how this will move forward. As the American people and Congress review the deal, it will be important to consider the alternative. Consider what happens in a world without this deal. Without this deal, there is no scenario where the world joins us in sanctioning Iran until it completely dismantles its nuclear program. Nothing we know about the Iranian government suggest that it would simply capitulate under that kind of pressure. And the world would not support an effort to permanently sanction Iran into submission. We put sanctions in place to get a diplomatic resolution. And that is what we have done. Without this deal, there would be no agreed-upon limitations for the Iranian nuclear program. Iran could produce, operate and test more and more centrifuges. Iran could fuel a reactor capable of producing plutonium for a bomb and we would not have any of the inspections that allow us to detect a covert nuclear weapons program. In other words, no deal means no lasting constraints on Iran’s nuclear program. Such a scenario would make it more likely that other countries in the region would feel compelled to pursue their own nuclear programs, threatening a nuclear arms race in the most volatile region of the world. It would also present the United States with fewer and less-effective options to prevent Iran from obtaining a nuclear weapon. I’ve been president and commander in chief for over six years now. Time and again I have faced decisions about whether or not to use military force. It’s the greatest decision that any president has to make. Many times, in multiple countries, I have decided to use force. I’ll never hesitate to do so when it is in our national security interest. I strongly believe that our national security interest now depends upon preventing Iran from obtaining a nuclear weapon — which means that without a diplomatic resolution, either I or a future U.S. president would face a decision about whether or not to allow Iran to obtain a nuclear weapon or whether to use our military to stop it. Put simply, no deal means a greater chance of more war in the Middle East. Moreover, we give nothing up by testing whether or not this problem can be solved peacefully. If, in the worst-case scenario, Iran violates the deal, the same options that are available to me today will be available to any U.S. president in the future. And I’ve no doubt that 10 or 15 years from now the person who holds this office will be in a far stronger position with Iran further away from my weapon and with the inspections and transparency that allow us to monitor the Iranian program. For this reason, I believe it would be irresponsible to walk away from this deal. But, on such a tough issue, it is important to the American people and their representatives in Congress get a full opportunity to review the deal. After all, the details matter. And we’ve had some of the finest nuclear scientists in the world working through those details. And we’re dealing with a country, Iran, that has been a sworn adversary of the United States for over 35 years. So I welcome a robust debate in Congress on this issue and I welcome scrutiny of the details of this agreement. But I will remind Congress the you don’t make deals like this with your friends. We negotiated arms control agreements with the Soviet Union when that nation was committed to our destruction. And those agreements ultimately made us safer. I am confident that this deal will meet at the national security interest of the United States and our allies. So I will veto any legislation that prevents the successful implementation of this deal. We do not have to accept an inevitable spiral into conflict and we certainly shouldn’t seek it. And precisely because the stakes are so high, this is not the time for politics or posturing. Tough talk from Washington does not solve problems. Hard-nosed diplomacy leadership that has united the world’s major powers, offers a more effective way to verify that Iran is not pursuing a nuclear weapon. Now, that doesn’t mean that this deal will resolve all of our differences with Iraq. We share the concerns expressed by many of our friends and Middle East, including Israel and the Gulf States, about Iran’s support for terrorism and its use of proxies to destabilize the region. That is precisely why we are taking this step. Because an Iran armed with a nuclear weapon would be far more destabilizing and far more dangerous to our friends and to the world. Meanwhile, we will maintain our own sanctions related to Iran’s support for terrorism, its ballistic missile program and its human rights violations. We will continue our unprecedented efforts to strengthen Israel’s security, efforts that go beyond what any American administration has done before. And we will continue the work we began at Camp David — to elevate our partnership with the gulf states to strengthen their capabilities to counter threats from Iran or terrorist groups like ISIL. However, I believe that we must continue to test whether or not this region, which is known so much suffering, so much bloodshed, can move in a different direction. Time and again I’ve made clear to the Iranian people that we will always be open to engagement on the basis of mutual interests and mutual respect. Our differences are real. And the difficult history between our nations cannot be ignored. But it is possible to change. The path of violence and rigid ideology, a foreign policy based on threats to attack your neighbors or eradicate Israel — that’s a dead end. A different path, one of tolerance, and peaceful resolution of conflict, leads to more integration into the global economy, more engagement with the international community, and the ability of the Iranian people to prosper and thrive. This deal offers an opportunity to move in a new direction. We should seize it. We have come a long way to reach this point. Decades of an Iranian nuclear program, many years of sanctions and many months of intense negotiations. Today, I want to thank the members of Congress from both parties who helped us put in place the sanctions that have proven so effective, as well as the other countries who joined us in that effort. I want to thank our negotiating partners — the United Kingdom, France, Germany, Russia, China — as well as the European Union, for our unity in this effort, which showed that the world can do remarkable things when we share a vision of peacefully addressing conflicts. We showed what we can do when we do not split apart. Check out the latest article on the Iran deal from the New York Times here.